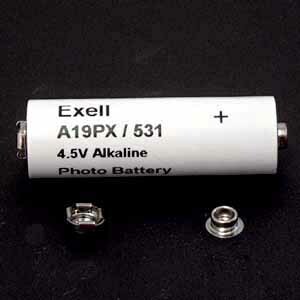 PX19 / 531 4.5V Alkaline used in Polaroid cameras. Equivalents are V19PX / 531 / RPX19 / A19PX / EPX19 / 3LR50 / 1307AP. Diameter: 16.8 mm. Height: 58.3 mm. Also known as: V19PX / 531 / RPX19 / A19PX / EPX19 / 3LR50 / 1307AP / Bosch Rexroth 1070085767. The PX19 or 531 is an unusual cell often used in older Polaroid cameras. It is a cylindrical battery with one mini snap connectors at each end (the same size of mini snap found in the popular 9Volt PP3 battery). The PX19 or 531 is a very hard to find battery. Consider buying more than one. These Alkaline cells have a shelf life of several years, so buy two and make sure you always have a ready supply of power for your camera whilst taking advantage of our reduced price multi-buy offer. The PX19 or 531 is the correct battery for the Bosch CC100 CC120 (CC100M CC120M) CNC controller.